Ergonomic Vertical design allows a stress free natural hand position that allows the user to relax the hand muscles and wrist. 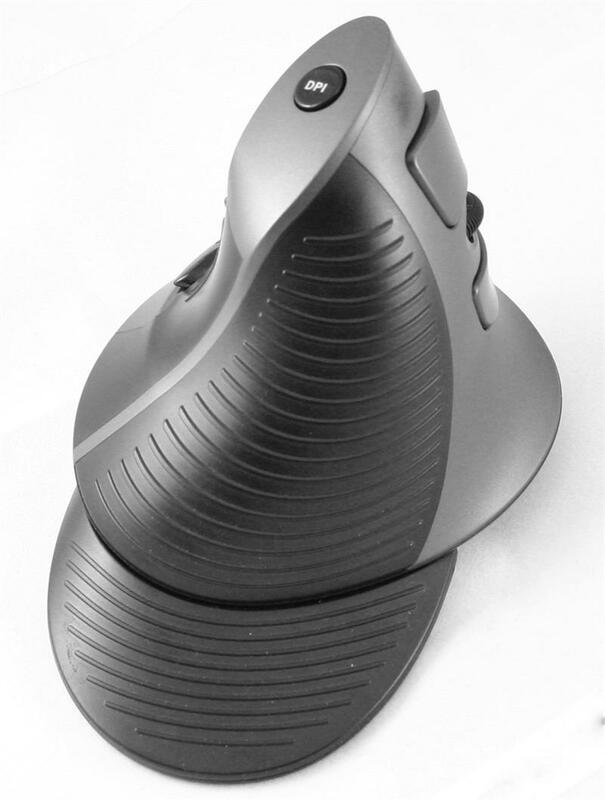 The integrated hand rest lets the user rest the hand comfortably without touching the desk surface but can be removed to suit the user. The left and right switches are arranged to match the hand position so there is no “reaching” for buttons. The well placed precision scroll wheel also has a switch that can be customized. Convenient browser “Forward” and “Back” buttons can be customized to other functions. This mouse features resolutions of 800, 1200 and 1600 DPI selectable by a switch located at the top of the mouse. Dimentions: 5.3"(L) * 3.75"(W) * 3.43"(H) in.